HP's Mini 1103 offers a 10.1-inch screen and sells for $299. It's expected to ship in December. 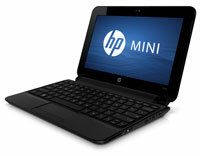 HP this week debuted the Mini 1103, the latest addition to the company's netbook lineup. The Mini 1103, which weighs in at 2.78 pounds, sports a 10.1-inch backlit display offering a resolution of 1,024 x 600 (WSVGA) powered by an Intel Graphics Media Accelerator 3150. It uses either an Intel Atom N455 or Intel Atom 475 processor, with clock speeds up to 1.83 GHz (512 MB level-2 cache and 667 MHz frontside bus). It comes stock with 1 GB RAM and can be expanded (via a single slot) to 2 GB in some configurations. Internal storage options include 7,200 RPM SATA drives in capacities ranging from 160 GB to 320 GB. It also includes a four-in-one card reader (supporting various SD cards, Memory Stick, Memory Stick Pro, and MultiMediaCard) and optional USB 2.0 CD/DVD drive. For networking, the Mini 1103 includes both 10/100 Base-T (RJ-45) and several wireless options, including 802.11b/g/n and Bluetooth. For connectivity, the unit includes three USB ports, VGA port, and combo headphone/microphone jack. Preinstalled operating systems on the Mini 1103 include Windows 7 Starter 32, SUSE Linux Enterprise 11, and FreeDOS. Other software installed on the systems includes limited functionality versions of Microsoft Office and Corel Office, as well as various HP utilities. The Mini 1103 is expected to ship in December for $299. Further information can be found here.